THE LABOUR PARTY conference will be held at the end of November despite calls from the party chairman for the event to be held earlier and before October’s Budget. 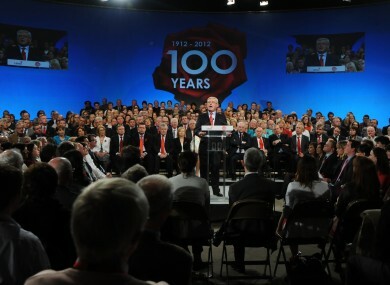 A meeting of the party’s national executive “agreed by consensus” that the conference be held on the 29 and 30 November in Leinster House today, according to a Labour spokesman. This was despite calls from party chairman Colm Keaveney, who lost the party whip last year, for the conference to be brought forward in the wake of the Meath East by-election result which saw Labour’s support plummet to below 5 per cent. Keaveney was also keen that the national party meet to discuss issues prior to the Budget – which is due to be held on October 15 – and had, according to the Labour spokesperson, brought forward a motion that the conference be held in September. However the executive instead opted for the end of November date. Keaveney said this evening that he was “delighted” that a date for the conference had been secured. Email “Labour conference to be held in November despite calls for earlier date ”. Feedback on “Labour conference to be held in November despite calls for earlier date ”.